This question comes up more than you think. People LOVE their home, the location and the memories that it holds, but it’s just not quite keeping up to their every changing family’s needs. How to decide if you should Renovate or Build?! The first step is to talk to your lender or mortgage broker to see what is feasible for you for either project. They will advise on how much you can invest back into your current home, or into purchasing another one. 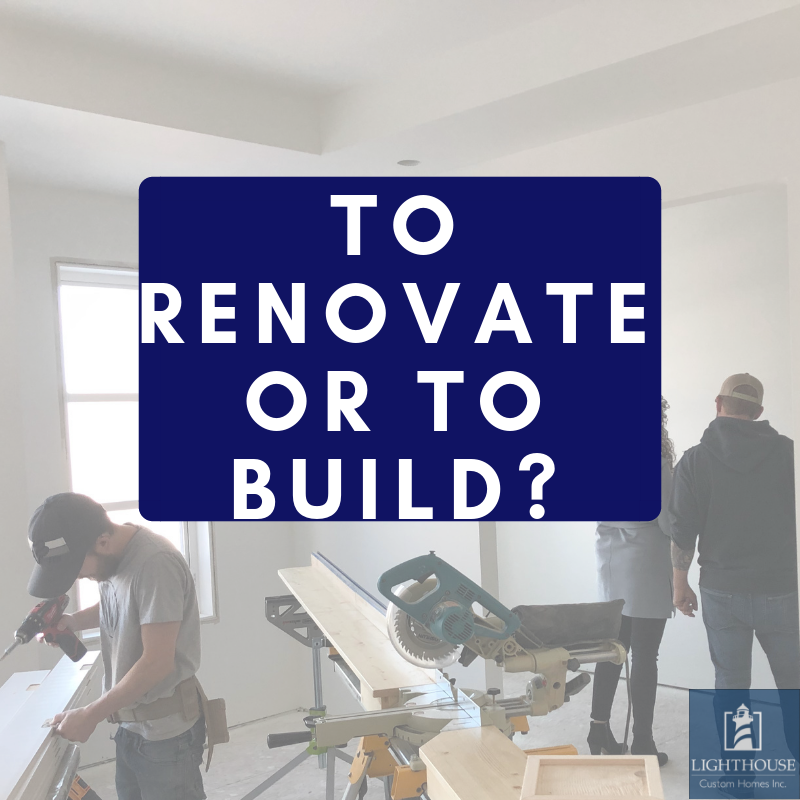 Renovating might sound like the best option for your beloved home, add a little square footage here, remodel a kitchen there, but will you get the investment back when it comes time to sell? Do you have to move out of your home during construction? How long do you intend on staying in your home once the renovation is complete? Will you be getting what you want after the renovation is complete or are you still compromising? These are questions to ask yourself and a professional. Having a realtor assess your home’s current market value and then anticipated market value with renovation is the first step. This way you can see if investing $200,000 will increase, decrease, or keep the value of your home the same. Is that $200,000 better put towards a new home exactly to your liking? If renovating seems like a great option, the next step is to make your wish list and meet with a Builder to assess the cost of the project. Again, making sure that $200,000 investment is not opening a can of worms to a $400,000 investment. Pulling back the layers of older homes can highlight other problems which is why hiring an expert to assess can help you save from expensive surprises later on. Renovating is not for everyone, but the reward of growing into a home that holds your memories can make renovating worthwhile. Reasons to renovate: you LOVE your home and area, you’ve attached sentimental value to the home that you just can’t shake, your renovations will add value to your home and you’re not making too many sacrifices. So, you’ve decided that renovating isn’t the best idea for you or your home, but do you really want a new one? Same steps apply for the build side of things, talking to your lender, assessing the market value of the lot you’re looking at building on and the cost of the build. It’s essential to see if your investment in the lot and home will be worth more or less when it comes time to move in. You can work together with a Builder and Realtor to determine this. Building allows you to get EXACTLY what you want! You choose the layout, the interior finishings, everything! It’s a really fun process that allows your dream home to come to fruition. Reasons to build: You like things brand new and warrantied, you know what you want and can’t achieve it in your current home, you know it’s going to be the best option, in the long run, your tired of constantly fixing up your current home. Still trying to figure out whether to build or Renovate? Call Andrea or email us at info@lighthousecustomhomes.ca so we can assess your current home and build options.